Two days ahead of that debate MPs were provided with a research briefing on the topic which explains the UK’s current position. “The UK proscribes the military wing of Hizbollah as a terrorist group, but not the political side of the organisation. The UK Government has long held the view that Hizbollah’s military wing has been involved in conducting and supporting terrorism, and in March 2001, the Hizbollah External Security Organisation (ESO), part of the broader military wing of Hizbollah, was added to the list of proscribed organisations under the Terrorism Act 2000. On 2 July 2008, Parliament passed The Terrorism Act 2000 (Proscribed Organisations) (Amendment) (No. 2) Order 2008, extending the prohibition to the whole of the military wing of Hizbollah. The previous day another research briefing titled “Lebanon 2018” was also published by the House of Commons library. Both the reports provided in those briefings amplify a myth concerning Hizballah’s origin that is commonly promoted in BBC content. The earlier report twice promotes Hizballah’s baseless claim of Israeli involvement in the murder of Rafik Hariri – a claim that has also been amplified by the BBC. The earlier report also promotes an assessment of the number of Palestinian refugees in Lebanon that was recently contradicted by a census that got no BBC coverage. The report’s author allows himself to promote his own conjecture concerning Israel’s security assessments but fails to provide British MPs with information concerning the Hizballah leader’s regular threats against Israel or the terror group’s efforts (together with Iran) to secure a presence on the border between Israel and Syria. Remarkably, neither of these reports makes any mention of Hizballah’s criminal activities abroad that fund its terrorism. The only oblique reference to Hizballah’s violations of UNSC resolutions – a topic serially avoided by the BBC – comes in the vague statement “UN Security Council resolutions call for armed militia groups like Hizbollah to disarm”. Hizballah’s manipulation of internal Lebanese politics (a subject similarly under-reported by the BBC) is also sidelined in the report, as are the effects of its terror activities on the Lebanese banking system. Like the BBC, this report also ignores the issue of Hizballah’s attempts to set up terror cells inside Israel. Given that these two research briefings are lacking much of the information relevant to an informed discussion of Hizballah, it would be natural for members of the British public and MPs alike to turn to their publicly funded national broadcaster in order to look for more in-depth information. Unfortunately, however, the BBC has itself spent years cultivating the myth of separate ‘wings’ of Hizballah and whitewashing the fact that it is a terrorist organisation through use of euphemisms such as “Lebanese Shia group” as well as misrepresenting its terror designation by numerous countries and misleading audiences with regard to its activities. The story of the Lebanese prime minister’s “stunning resignation” – as the BBC described it when news of Saad Hariri’s announcement broke on November 4th – can obviously only be fully understood if one is familiar with one of the other major players in that story: Hizballah. Essential context to that story of course includes the background to the current political landscape in Lebanon – a story that was reported very superficially by the BBC at the time. Clearly too it is important to understand the extent of Hizballah’s influence within the Lebanese government and armed forces as well as the effects that Hizballah’s intervention and actions in other countries has had on Lebanon. An understanding of which countries and bodies designate Hizballah as a terrorist organisation is also crucial, as is familiarity with the extent to which Hizballah is financed and supplied by Iran – and how that translates into Iranian influence in Lebanon. “Over the last 11 months, Hariri became a fig-leaf for Hezbollah. As one of the main leaders of the opposition, his appointment as prime minister ostensibly proved Lebanon was maintaining its independence vis-a-vis Iran. 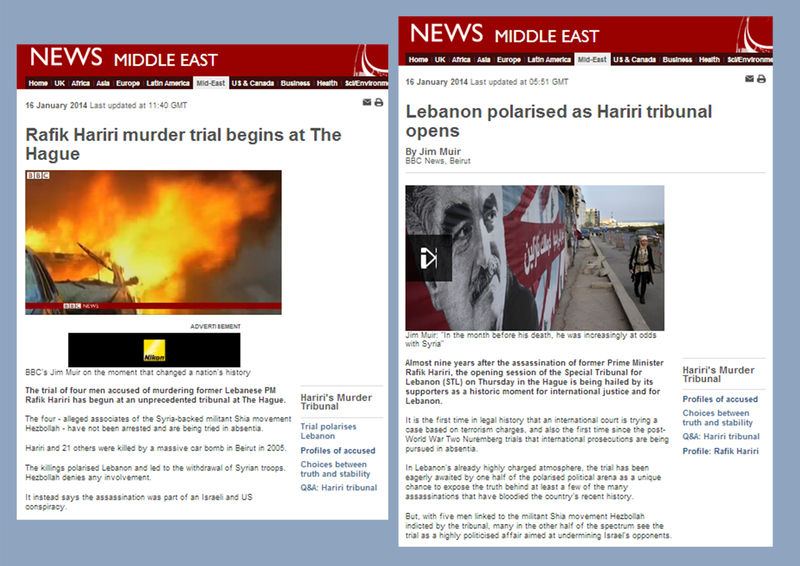 Since Hariri made his announcement the BBC News website has produced a considerable amount of coverage of the story. However, much of that reporting included softball portrayal of Hizballah which failed to provide BBC audiences with the context essential for full understanding of the story. The website’s first article on the story – “Lebanese PM Hariri resigns, saying he fears assassination plot” (4/11/17) – whitewashed the financial and military support provided to Hizballah by Iran and airbrushed the terror group’s militia from view, calling it a ‘political party’. No explanation was given regarding the fact that the “political deadlock” was caused by Hizballah. “Taking up the prime minister’s office last year, Mr Hariri promised a “new era for Lebanon” after two years of political deadlock. A report appearing the next day – “Lebanon Hariri resignation a plot to stoke tension, says Iran” (5/11/17) – mentioned the murder of Hariri’s father without clarifying that Hizballah operatives have been indicted by the UN’s Special Tribunal for Lebanon. A report titled “Lebanon PM forced by Saudis to resign, says Hezbollah” that appeared on the same day also failed to mention the STL, downplayed Iran’s financial and military support for Hizballah and once again failed to make any mention of its numerous terror designations. “The leader of Lebanon-based Shia group Hezbollah has said that Saudi Arabia forced the Lebanese prime minister to resign. “As he resigned on Saturday, Mr Hariri blamed Iran for meddling in several countries, including Lebanon, and said he felt the climate was similar to that which “prevailed” before his father, former Prime Minister Rafik Hariri, was killed by a bomb in 2005. “After taking office last year, Mr Hariri promised a “new era for Lebanon” after two years of political deadlock. An article by Lyse Doucet – “Riyadh’s night of long knives and long-range missiles” (6/11/17) – briefly touched on some of the essential background that BBC audiences had hitherto lacked – albeit mostly in the form of quotes rather than her own analysis. “Just last month, the US House of Representatives endorsed the imposition of new sanctions against Hezbollah as part of the Trump administration’s drive to exert greater pressure on Iran. The BBC’s new Beirut correspondent Martin Patience also briefly referred to one crucial point in a report titled “Lebanon in crosshairs as Saudi-Iran tensions soar” (10/11/17) but again failed to clarify the real meaning of the phrase “Iran backs”. “Iran backs the Shia movement Hezbollah here. Its supporters believe Mr Hariri’s resignation was orchestrated by the Saudis in order to weaken their influence in the country. However, on the same day a report titled “France’s Macron makes surprise Saudi visit amid Lebanon crisis” (10/11/17) returned to vague phrasing. Readers saw the use of a standard BBC euphemism – “militant group” – in a report titled “Lebanon Hariri crisis: President Aoun demands Saudi answers” (11/11/17) which made no effort to explain Iran’s financial and military support to Hizballah. The same was seen in an article headlined “Saad Hariri: Lebanon return from Saudi Arabia ‘within days’” (13/11/17). “”I am not against Hezbollah as a party, I have a problem with Hezbollah destroying the country,” he said. On November 15th audiences saw the BBC’s first reference to Hizballah as an Iranian proxy in a report titled “Saad Hariri: Saudis detaining Lebanon PM says Michel Aoun” that gave a very limited description of its terror designation and made no effort to explain the background to the current political landscape in Lebanon. However – eleven days into the story – readers also saw the first mention of Hizballah involvement in the murder of Rafik Hariri. The same reference to the STL appeared in a report titled “Saad Hariri: Lebanon PM ‘can go to France when he wants’” on November 16th along with a description of Hizballah as Iran’s “proxy”. By November 18th Hizballah had again been downgraded to an “ally” of Iran with the report titled “Saad Hariri, Lebanon PM, to return to Beirut ‘in coming days’” making no mention of Iran’s patronage of the group or its terror designations. As we see, none of these BBC reports gave audiences a comprehensive view of Hizballah’s designation as a terror organisation by the United States, the Arab League, the Gulf Cooperation Council, Canada, France, the Netherlands and Israel and the designation of its so-called ‘military wing’ by the EU, the UK, Australia and New Zealand. The majority of the reports (eight out of eleven) failed to clarify that Hizballah members have been indicted for the murder of a previous Lebanese prime minister. Portrayal of the extent and significance of Hizballah’s influence on Lebanese politics and armed forces was mostly absent from the BBC reports and the role it played in the “political deadlock” before Saad Hariri became prime minister was ignored. Most glaring, however, is the fact that none of these eleven reports made any effort to provide BBC audiences with details of the extent of Iran’s financial and military support for the terror group’s activities. Clearly BBC audiences have not been provided with the full range of information necessary for proper understanding of this story.